Andy Goldsworthy's beautiful ephemeral artworks have been rendered timeless in numerous photographic records. But over a period of nearly twenty-five years, he has also produced more than 120 permanent installations all over the world in three continents. 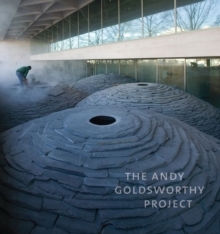 This is the first significant volume devoted to Goldsworthy's work in nearly twenty years, and the first to underscore the artist's permanent output since 1984. The artist's sculpture and practice are situated within an ages-long tradition of structures and also trace the development of `Roof', his permanent, site-specific sculpture at the National Gallery of Art,Washington. In January 2003 Andy Goldsworthy was invited to create a work of art for the National Gallery of Art. The project began with a series of ephemeral works on Government Island in Stafford County,Virginia. From this phase a series of photographic suites and a diary remain. The second phase of the project resulted in `Roof, comprising nine stacked-slate domes installed over the course of nine weeks by Goldsworthy, his assistant, and a group of drystone wallers in the winter of 2004-05. The combination of documentation of all the permanent installations, in-depth analysis of `Roof' and contextual essays make this a landmark publication on the artist.